Bumble Bee Foods was founded by a handful of dedicated fishermen in 1899. Today, privately held and headquartered in the United States, Bumble Bee Foods, LLC is North America’s largest branded shelf-stable seafood company, offering a full line of canned and pouched tuna, salmon, sardines, and specialty seafood products marketed in the U.S. The Bumble Bee brand has established significant consumer awareness and loyalty based on the quality, nutritional value and affordability of its products. Take a look back to see how Bumble Bee became a leader in the seafood industry. 1899 - A group of 7 canners in Astoria, Oregon formed Columbia River Packers Association, CRPA. Together, they set out to fish and process salmon. 1900 - CRPA purchased several sailing ships and began building a cannery on Alaska’s Bristol Bay. 1910 - The Bumble Bee Brand was born as one of many CRPA marketed labels. Albacore tuna was discovered in seasonal abundance off the Oregon coast. 1920 - CRPA began expanding its cannery in Astoria to capitalize on Albacore. 1930 - 1950 - Albacore surpassed Salmon as the company’s principal product. As CRPA grew into a recognized leader in the industry, Bumble Bee became one of the most respected premium labels for canned seafood. 1960 - The first Bumble Bee Seafoods, Inc. was formed as a wholly owned subsidiary of Castle & Cook, a prominent Hawaii based seafood company. 1977 - Bumble Bee continued to expand, acquiring a tuna cannery in Puerto Rico, a fishing base operation in Ecuador, and Harbor Industry cannery in San Diego. 1984 - Bumble Bee underwent a series of ownership changes. 1997 - After International Home Foods Inc. (IHF) acquired Bumble Bee and Orleans Seafoods, Bumble Bee launched a new line of "Specialty Products" including shrimp; oysters; clams; smoked scallops; anchovies and more. 1999 - Bumble Bee purchased BC Packers – a Canadian company that canned Clover Leaf, the leading brand of tuna and salmon in Canada. Bumble Bee also began distributing the nation’s leading brand of high-quality packed Sardines, King Oscar. 2000 - Bumble Bee was acquired by Conagra Foods. 2003 - Bumble Bee became Bumble Bee Seafoods, LLC. 2005 - Bumble Bee announced its name change to Bumble Bee Foods, LLC to reflect its expansion into new food categories, with the acquisition of Castleberry/Snow’s and assets of Sara Lee Shelf-Stable Meats business. 2008 - Connors Bros. sells Castleberry’s Food Company to Hannover Foods. Bumble Bee became a privately held U.S. company upon being acquired by Centre Partners. 2010 - Bumble Bee Foods is acquired by Lion Capital LLP. Pasta salad is on a lot of dinner tables at family get togethers. And this tuna macaroni salad is no exception. Serve it chilled. Serve as a main course. Mix all the ingredients together in a large bowl. Cover and put into the refrigerator until ready to serve. Enjoy! I had no idea about all of this history. The salad is a classic for sure! 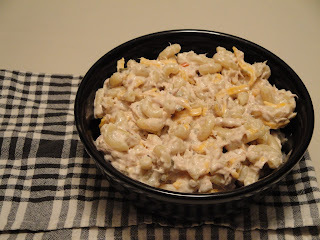 Tuna macaroni looks awesome. Nice post! Btw, I tried adding you with google connect, but it doesn't work on your blog. Thanks for letting me know. It's working now.